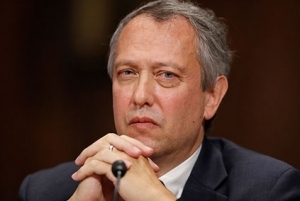 The good people at the Leadership Conference on Civil and Human Rights have produced a list of the “Top Ten Most Extreme Judicial Nominees Pending in the Senate” and, not surprisingly, North Carolina’s Thomas Farr is featured. Conservative movement lawyer who defended North Carolina’s monster voter suppression law (with Thomas Farr), fought against marriage equality and transgender rights, opposed DAPA and DACA, represented Hobby Lobby in its fight to deny working women access to contraceptive coverage, and worked to limit the rights of people charged with crimes. Served as chair of Governor Scott Walker’s judicial selection commission for state judges and recommended individuals who had made extreme and hateful anti-LGBTQ comments. Possesses a far-right judicial philosophy and does not respect stare decisis. Nominated over the objection of home-state Senator Baldwin. Defended North Carolina’s 2013 monster voter suppression law (with Kyle Duncan), represented Jesse Helms’ 1990 Senate campaign – which was notorious for suppressing the vote in Black communities – and represented corporations seeking to undermine workers’ rights and protections. Attempted to justify the use of torture and participated in politicized hiring at the George W. Bush Justice Department. Fought against marriage equality and sought to have a gay judge removed from the case. Challenged the legality of the Affordable Care Act and affirmative action. Hostile to reproductive rights and one of the NRA’s go-to attorneys. Republican state senator with demonstrated hostility to voting rights, workers’ rights and protections, removing Confederate monuments, LGBTQ equality, refugees, immigration, gun safety, and reproductive rights. Ideologically extreme culture warrior who has made bigoted and offensive comments about transgender individuals, marriage equality, and women’s reproductive rights. Lacks respect for precedent and the rule of law. Failed to disclose her record supporting and advancing extreme and widely-discredited, unscientific views about abortion and birth control, and opposed humanitarian resettlement of Syrian refugees. Texas state government lawyer who has fought against DAPA, reproductive rights, clean air regulations, gun safety, and housing discrimination. Failed to disclose his record of bigoted and offensive remarks about LGBTQ equality, diversity, and reproductive rights. Hostile to public education. Opposed by home-state Senator Baldwin. and sexual assault. Opposed by both of his home-state senators.